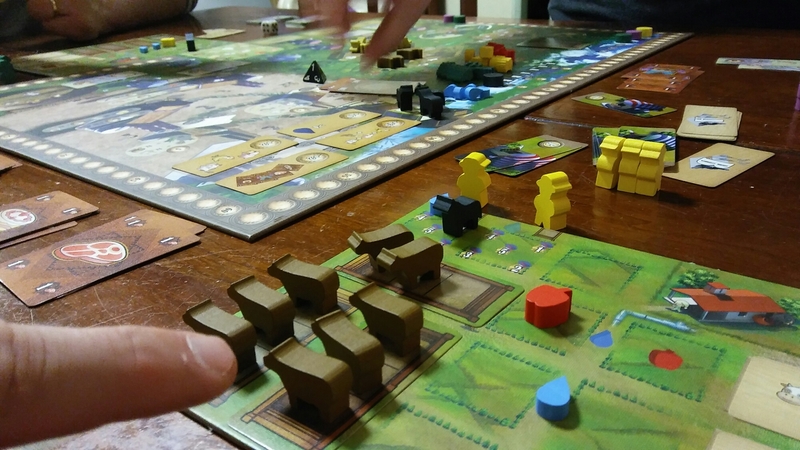 In Mi Tierra, each player plays as a farmer who tries to make the most of their individual plots of land by raising and harvesting crops, care for livestock, raise horses to compete, sell to the markets and change goods into better goods. The person who has the most money at the end of the game will be the winner of Mi Tierra: New Era. Each player starts the game with a player mat, four workers (in a 2-3 player game), and ten pesos, if you are going first then each player after will get one more than the previous player. Second will get 11, third 12 and so on. There are a lot of things to set up on the board. Put all the animals in their areas, seeds for vegetables and fruit in the farmers spot. Put one worker of each players color in the appropriate spot. 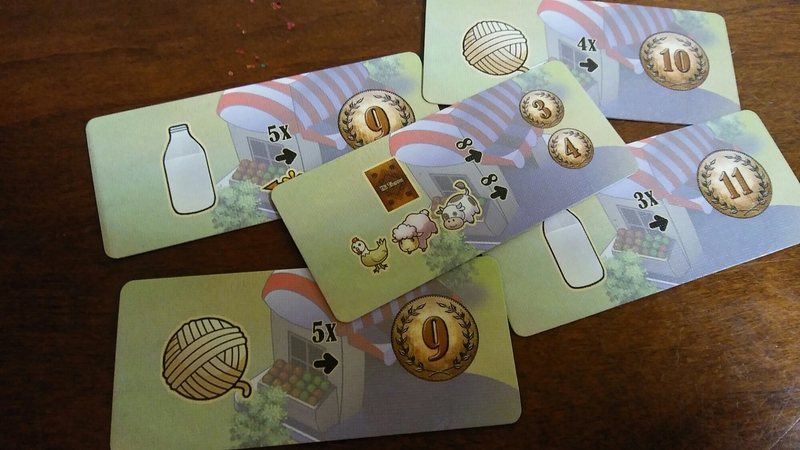 Technology cards will be placed on the board as well as four Countryside Market cards and 4 City Markets. Countryside markets will get replaced each round, City Markets will not. Seperate all the tiered goods and place them somewhere near the board. All apples together, grapes, eggs, etc. The beginning to a prosporous farm! There are 4 modules included in the game but I will just be talking about the base game with no modules added. The game is now set up and ready to play. Money is points in this game….period! When ever you pay for something you pay with points. Each time you sell something you earn points….its that simple. Do not be like me and run out of money after the first turn and waste an entire round doing nothing!!! This game is a worker placement game at the core. During each round, players will take turns putting their workers out to take various actions. All workers will be placed before any actions are done. Once all the workers are placed then the areas will trigger in a certain order, starting with one and going to 17, if the rodeo is in town. The rodeo shows up in rounds 2, 5 and 7. When trying to get crops you go to the seed farm. Take a seed meeple of the crop you want and put it on your farm in an area you want to harvest from. These are only seeds and do not leave your board unless you want them to. When you harvest, you take the card that has that good on it. If I harvest apples, I would put my worker in between two apple seeds and if I have water to each field, I would take two apple cards from the pile. There are tons of actions to take, so I will not explain all of them but only some. Most of the spaces just get you animals or goods. To get animals, you need to roll a die. 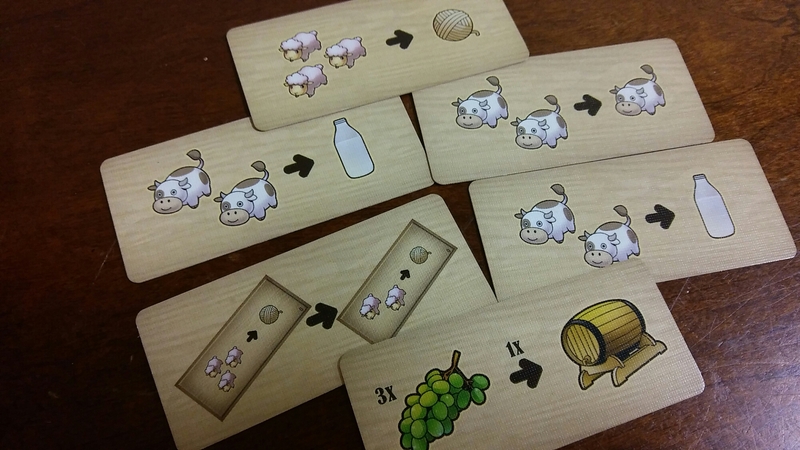 For cows you will roll a four sided die and for sheep and chickens a six sided die. You will get animals based on the number you rolled. 1-3 for a cow gets you one and a 4 gets you two. Chickens and sheep are similar, just with a six sided die. When you get horses you just get one. Water is also done this way, exactly like the cows. The other spots you can go to just process certain goods into other goods. Chickens produce eggs, cows milk and sheep yarn. You can then turn wheat into flour, grapes into wine, etc. The important thing to remember is there are three tiers of goods. Apples, grapes, wheat, and meat are level one goods. Wine, egg, yarn, milk and flour are all tier 2 goods. Then tier three goods need a combination of tier one and two to create. The tier three goods will give you bonus points at the end of the game, based on sets. One of the keys to the game are the Improvements you can make to your farm. These allow you to get benefits from spots that you don’t send workers to. Allowing you to use your workers for other things. Some allow you to breed your animals, others allow you to use the factory without paying. They are the key to getting your farm running smoothly and maximizing your strategy. The next action spots that gets activated is your player board. When you place workers on your own player board they will work in your farm. They need water on their farm in order for them to do anything. Water needs to be placed by seeds to harvest goods and in horse stables to train your horses. You either put your worker in between two planted crops or one of the horse stables. You can’t harvest two different crops with the same worker. You can always double your harvest by discarding the water that is next to them. To train a horse you place a worker there and discard an apple to move your horse up one level. You can double your training by discarding two apples and the water at the stable. The markets are the last things to trigger. Countryside Markets will have a good to sell and will tell you how many times that good can be sold and for how much. You simply pick which one you want sell and discard the card. Then a new card comes out immediately. The first 4 spots can only sell at the established market cards. The last two spots can go to the black market. You will sell last but being able to use the Black Market is extremely valuable and should not be ignored. The City Markets are first come first served and do not get refilled through out the game. Once they are met they go away. You simply discard the goods on the card and get the money shown. Rodeos trigger at the end of the second, fifth and seventh rounds. In order to participate in a Rodeo, you have to have a horse that is at least level one and announce you are entering it into the Rodeo. You do not need a worker to do this. Who ever has the highest ranked horse will win, followed by the next level and so on. The points are different each time. The first Rodeo is 15 points for the winner. The second Rodeo is 20 and the last one is 25. Second place in each Rodeo gets half of the first place and third gets half of second place and so on. It is possible for a player to get both first and second place in a rodeo. 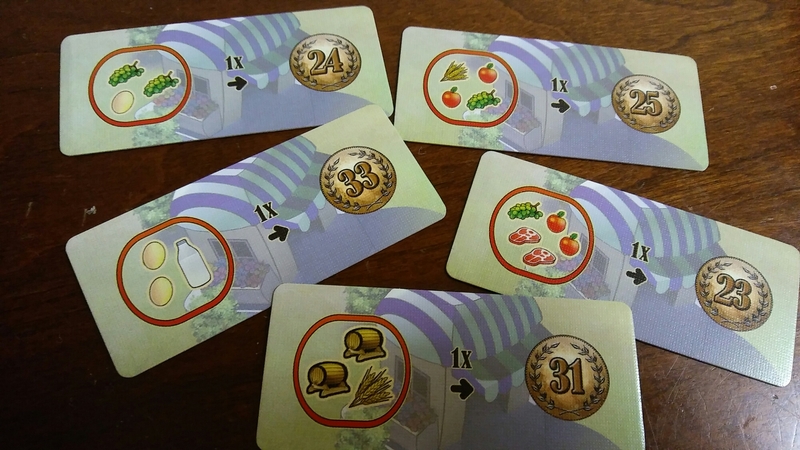 After the Rodeo in round 7 each player adds to their pesos total so far their bonuses for sets of tier three goods, either same or different goods. They sell all of their tier one and tier two goods based on the Black Market value and get bonus money from any Improvement cards they bought and the player with the most money is the best farmer in Mi Tierra: New Era. All the components are pretty solid in this game. Wooden seeds and animals are nice. Cards are fine although could have been a bit thicker. Most of the cards are a weird size and will be impossible to sleeve if cards become worn due to being thin. The player boards are nice quality cardboard. The art is fantastic! 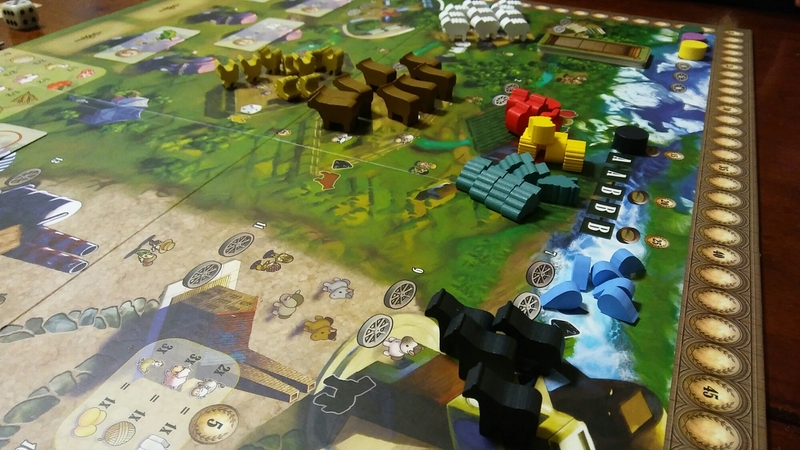 Overall the components are really good but not spectacular. There are tons of stuff going on in this game…..maybe too many. Each action in the game seems to have its own little spin or mechanism with it that makes it hard to digest sometimes. One of the great mechanisms in the game is a simple one. The fact that your money represents your victory points is great. Nothing new, but I love when games give you that decision on how many points do I want or need to spend to do this action. The other one I really like is the Technology mechanism. When you go to the technology you put your worker in between two different technologies or in the middle of all four. Then in turn order each player at the Technology area buys the technology they want to buy. You pay the amount of how many technologies your worker is currently touching when bought. Meaning you might spend 2 to get one or if someone bought one of the other ones before you, you will only pay 1 peso. These improvements allow you to activate a space without putting your worker there. I really like the strategy involved with this mechanism. The other mechanism that I think shines is the Countryside Market. On the market, you place your worker in one of six available spots. They will trigger from top to bottom. Depending on where your worker is, that is how many actions you can take and where. The first two only allow you to make one transaction to the Established Markets, meaning the cards. These only allow you to sell. The third and fourth spots allow you to make two transactions but also only to the card markets, sell only!!! But the last two spots opens up the Black Market, where you can sell OR buy goods. This is so important….markets give you a steady stream of money each round and the black market allows you to buy goods that you don’t have time enough to produce on your own. The mechanisms that I think doesn’t quite hit it for me is the acquiring animals by rolling dice. I just don’t understand the concept behind that? I think it should have been buying animals. That would put more emphasis on the dynamic between spending victory points to get more things. I would have liked to see something like, the first chicken is 3 pesos, each chicken after that is reduced by one. One for three, two for 5 and three for 6. There is a ton of strategy in this game. Most of it is simply what are you trying to work towards. There is a little bit of randomness in the card draws on markets and improvements. The first couple of rounds, the improvements that are available will really set the tone for your strategy. By the third and fourth round if you don’t have an Improvement things will get a little difficult for you to keep up. Once you have your strategy, you have little restrictions. Most of the time more than one person working on the same strategy is rare. If you see someone going for chickens….why go for chickens? Go for cows and get eggs through the black market. There is also some randomness when rolling for animals with the dice. That can get frustrating if you are rolling a one every time to get only one animal and someone else rolls a six and gets three animals. That can be a huge advantage of cranking out tier two goods quicker and more often. I would also say that animals seem easier to get started and going where as crops tend to take more rounds to get the engine running. There is quite a bit of replayability in this game. Between all the different animals and foods, you can play multiple times just using different combinations on each. You could focus on just trading in the market, only upgrading goods to tier three goods, focus on the rodeo each time. They are all very solid strategies and viable to win. I haven’t even mentioned the modules that come in the game that can be added or left out. Each one brings a different element. This did not get a top score because at the root of it you are still just trying to produce second and third tier goods. But there are plenty of different strategies to take to get those goods and more pesos! Over all I am very pleased with Mi Tierra: New Era by Alberto Adubinen and Diego Benavente. It is a really solid game that plays pretty quickly. The first time you play it may seem too simple or not long enough. After the initial play, you start realizing how to maximize everything to get the most out of each turn. I love the different strategies and how your farm is a puzzle by itself. I can honestly say that this will be around for a while. There are times that you will totally screw up your turn and it will be devastating but you always feel like you are within reach of winning. The sign of a great game, in my opinion, is when each player plays a different strategy and scores even themselves out. In a three player game, we were all within 20 points of each other and first won by ONE single point. Twenty might seem like a lot but knowing that one tier three good is worth 35 points (and I had waisted one round because I ran out of money)….it really isn’t. 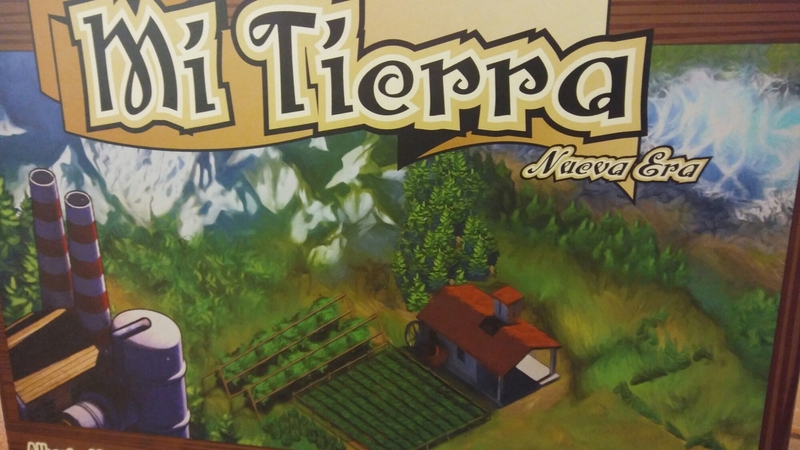 Mi Tierra: New Era is a solid worker placement/resource management game that has just enough mechanisms to keep it different.